For those who enjoy a two-wheeled adventure down some of Montana's downhill runs, Yellowstone and Big Sky offer some of the finest. 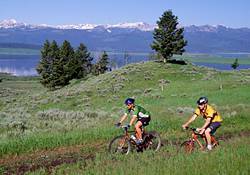 There are trails for advanced riders and trails for beginners. A helmet is required on all trails. The views are spectacular from just about any trail, so take some time to look around and enjoy yourself.